In case you missed the previous post, Melinda (my roomie) is one fantastic gal. This semester she is taking an etymology class. 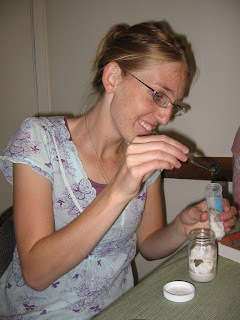 My roommates and I have all gotten on the bug bandwagon and are ruthlessly stalking any interesting insects we see and placing them in the freezer for Melinda's collection. Thursday night Melinda mentioned that she was going up to the bell tower to look for bugs and was wanting someone to go with her. For those of you unfamiliar with BYU, the bell tower is lit up every night by several large spot lights. This bright glow attracts young lovers and bugs of all types. We went crazy netting, grabbing, and pinching bugs of all shapes and sizes until the bags and tubes were full and we were mostly blind from staring into the lights. 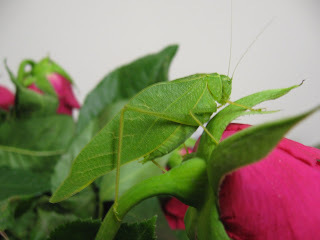 One of our most exciting finds was a couple of katydids. My grandma Temus and Liz have called me Katie-did for years but I never had seen the critter I was named after. I let this guy out of his bag and he made a bee line for the dying roses on our counter and started clicking. I never could quite tell how he made the clicking noise. These lovely insects are elegant, emerald green, and very friendly (this one sat on my finger). I am happy to be named after such a delightful creature. 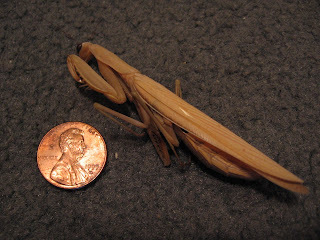 After all, I could have been named after something a bit more eerie like a preying mantis.